Something got into me this weekend and I couldn't take my mind away from a Lemon Cake. Coupled with a few fresh blueberries I bought at the market on Friday...I had a plan for today's cake. 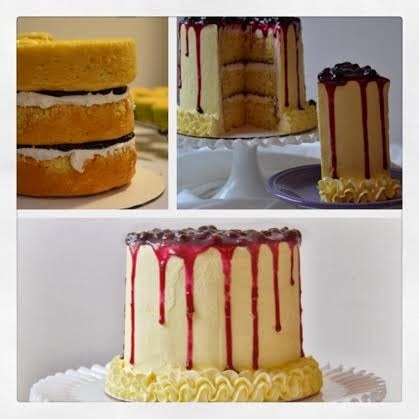 I knew for sure I wanted to bake a small (6") triple-layer, round cake. Of course this one got away from me and measured almost 6" tall by the time I was finished with it. 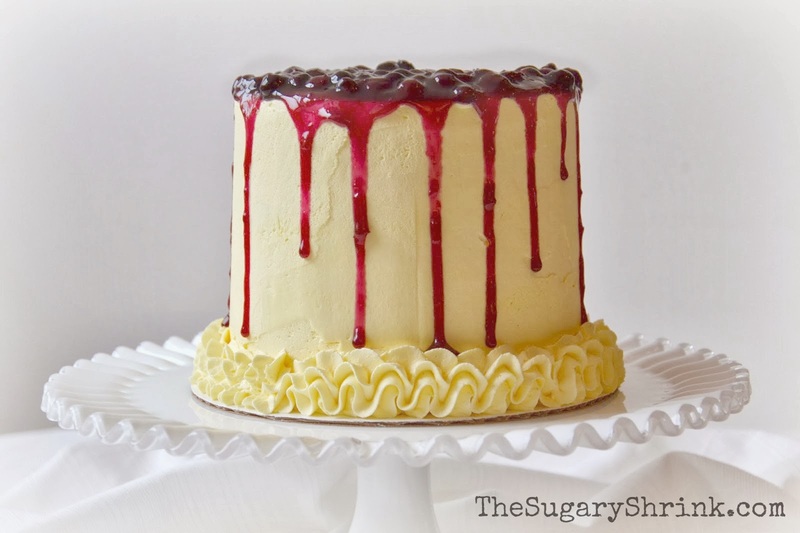 Realistically, this is a tall piece of cake, but it can be served, just barely. The cake baked up well, but I decided to take a short cut and not use parchment paper rounds at the bottom of the pan. Usually that's ok, but with the thickness of the cake layer and probably taking it out of the oven a minute or two soon...this is what happened when they were upturned. Not that it matters all that much once the filling is on, but it's not a best practice. Hot tip: Avoid shortcuts. I love shortcuts! But it's a total bummer when the shortcut doesn't work out. I've learned this in other areas of my life, now I need to practice it more consistently in baking. Stacking the cake...I'd have preferred a fresh berry compote, but didn't have enough blueberries (there were pricey enough as it was!). Instead, I opted for the blueberry preserves work around. Starting with the bottom layer of cake, then adding a lemon cream cheese buttercream, and finally a bit of preserves. It layered quite nicely...until the crumb coat. Right away I knew I was in trouble when the cake needed a center dowel to keep the layers together - cake can't help but slide apart (or list to one side) when jam is involved. And, I didn't thin out the buttercream filling before crumbcoating (the crumb coat for the side and top of a cake goes on more smoothly if it is less stiff than the filling). Gaaahh!! It was a cascade of badness...which led to this layered mess. I popped it into the cake fridge over night, knowing, if it all set - there would be a chance to turn this train wreck around. 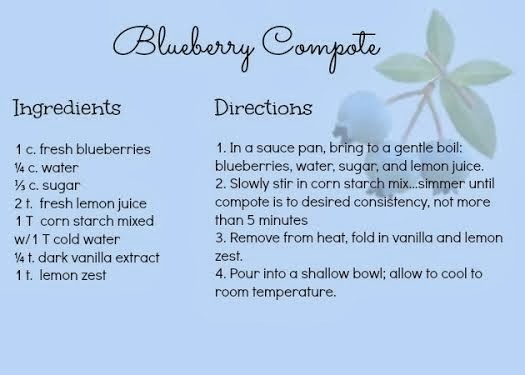 Before even thinking about buttercream, frosting, or taking the cake from the fridge, I needed to cook up the blueberry compote. I'm not calling this a blueberry sauce because blueberry compote sounds so much sexier. [Compote: A dessert made with fruits cooked with sugar.] I adapted a recipe from mybakingaddiction.com. I decided to go with a compote over cake..because I've never seen one before. Blueberries over cheese cake, pancakes, waffles, biscuits, etc. but, a cooked compote over lemon cake just makes sense! And how delicious can this be with a cream cheese filling and an outside of buttercream? While the compote cooled, which didn't take hardly any time, I prepared the Lemon Buttercream (1 t. clear vanilla, 1½ t. lemon extract). My goal is always a smooth frosting, but it doesn't always work out like that. When the fresh blueberry compote was cooled and ready, I slowly spooned the it on top of the cake...gently coaxing it to the edge. I was nervous slicing this cake, since it would like not be able to stand up on its own, but it held up. Yeah me! Also, the train wreck that was the crumb coat is barely noticeable when sliced. I'm happy with the results. This cake looks like what I had envisioned. I plan to bake this cake again for a special occasion. Tuesdays are special, right?